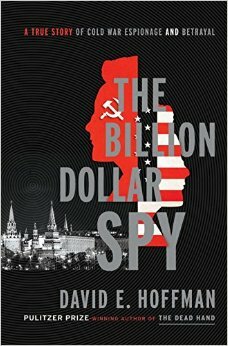 Veteran journalist and author Joseph C. Goulden offers a good review of David E. Hoffman's The Billion Dollar Spy in the Washington Times. In a nutshell, Yes. Such is the conclusion of David Hoffman’s account of perhaps the most productive spy in CIA history, Adolf Tolkachev, a Soviet aeronautical engineer. Over six years, from 1978 to 1985, he gave CIA officers thousands of pages of top-secret documents. The key revelations dealt with two key Soviet weapons systems: ground radars that defended against attacks, and radars on warplanes that provided the capacity to attack others. Further, the intelligence revealed just how far the Soviets lagged behind the United States in weapons development — permitting President Ronald Reagan to enter into arms agreements knowing that American national security would not be endangered. What the military learned also potentially saved the lives of American pilots who might have faced the Soviets in the event of war.